After this story was published, Dallas World Aquarium (DWA) complained that its side of the story had not been fairly represented, that elements of our reporting contained inaccuracies and made legal threats against Mongabay. As a result of the new input we have added a series of annotations, correcting several points and adding DWA’s views. Note that the DWA provided very limited information in the original reporting despite numerous inquiries. 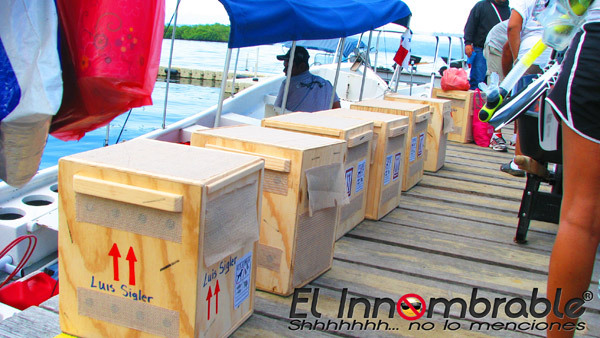 Last Monday (9 September 2013), the police officer on morning duty at Isla Colón International Airport, Panama noticed some foreigners loading crates with what appeared to be animals on a private jet . Finding this suspicious, he alerted his supervisor. 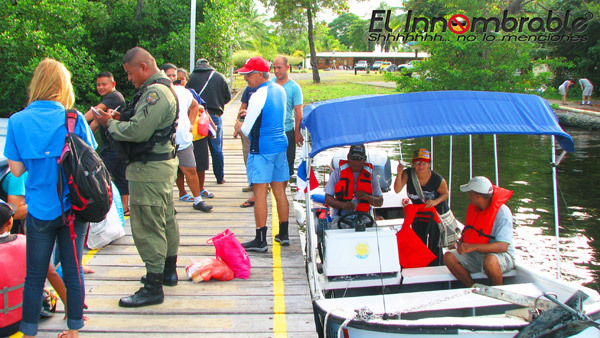 Within minutes, the local police chief, the mayor of Bocas, the director of the regional office of the National Environmental Authority (ANAM), community leaders and heads of local conservation organizations were informed about the incident. Little by little, a crowd of concerned citizens from Bocas town gathered around what turned out to be eight pygmy sloths – some of the rarest mammals on Earth. Escudo de Veraguas, Panama. They live nowhere else in the world. For the past 15 months, Bryson Voirin, expert on pygmy sloths and member of the International Union for Conservation of Nature (IUCN) Species Survival Commission, has been tracking ten of them with radio-collars to find where on the island they spend their time. 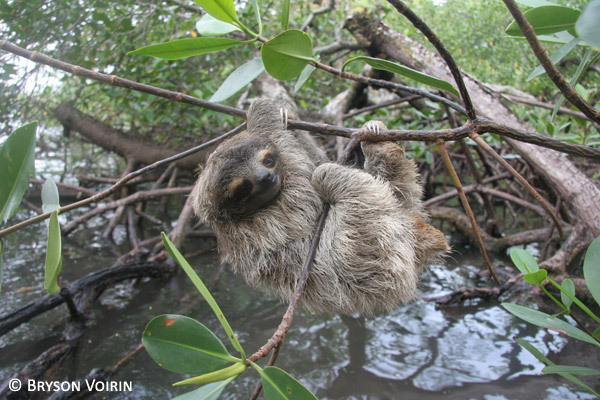 Voirin has been working on sloth conservation in Panama for the last 10 years alongside scientists from Zoological Society London, Smithsonian Tropical Research Institute (STRI) and many local organizations. But on Monday, as the drama at the airport was developing, it became clear that the foreigners who were trying to export the pygmy sloths were Luis Sigler and Daryl Richardson of Dallas World Aquarium, Jason and Julia Heckathorn – children’s books publishers and amateur naturalists based in the U.S., and Judy Arroyo and Rebecca Cliffe from a sloth rehabilitation center in Costa Rica . According to the flight manifest, the charter flight was headed for Island Roatan in Honduras before its final destination: Addison airport, Dallas. None of the passengers wanted to comment about the reason for this interim destination . By Monday evening, Dallas Aquarium officials had relinquished possession of the eight sloths. The animals were to be taken back to the island on Tuesday morning and released into the mangrove forest . 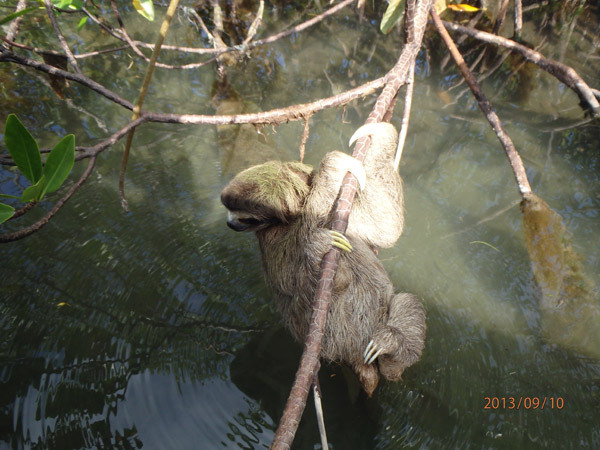 Pygmy sloth released back on Isla Escudo de Veraguas last Tuesday. Photo credit: Shannon Thomas / the Sea Turtle Conservancy. The local protesters, however, were distrustful and so an agreement was made that two local citizens would spend the night camped out by the sloths’ temporary holding enclosure in order to ensure they were not removed from the country before they could be returned to Isla Escudo de Veraguas the next morning. Even though the eight pygmy sloths are now back in their home, all is far from over. Breeding programs for some threatened species have been successful. However, three-toed sloths are very difficult to maintain in captivity. They often do not survive, nor reproduce. For years, many have tried to maintain them artificially outside the Tropics, and nearly all have failed. According to Dr. Jutta Heuer, from Halle Zoo, Germany, one of the world experts in sloth husbandry in Europe, there is little to no experience with keeping, breeding and feeding three-toed sloths in captivity. “A modern and serious zoo should never bring wild animals in without knowing this basic information. As studbook keeper for two-toed sloths in Europe I can say that because of ignorance and lack of experiences from zoos, a lot of sloths paid with their lives in the past,” says Heuer. The temporary overnight enclosure for the contested pygmy sloths. Photo credit: Jahir Amir Torres via The Bocas Breeze. All professionals from the international sloth conservation community contacted by mongabay.com were caught by surprise by the actions undertaken by Dallas World Aquarium . 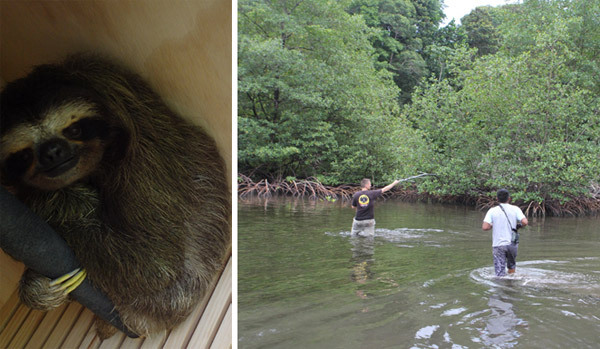 Pygmy sloth release back on Isla Escudo de Veraguas. Photo credit: the Sea Turtle Conservancy. The conservation plan-type document was not drafted by any particular conservation organization (nor the Dallas World Aquarium). 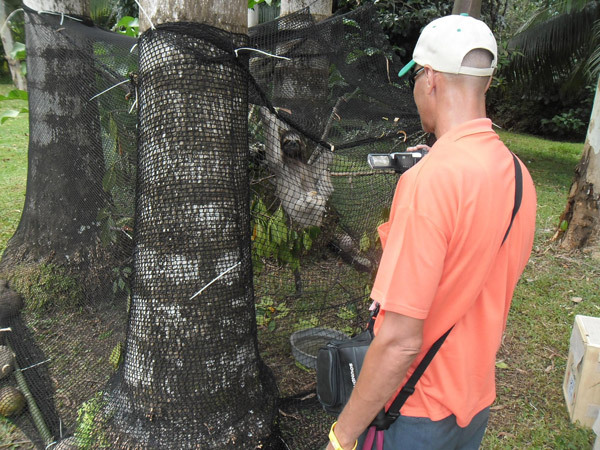 Instead, it was put together and emailed around by Jason and Julia Heckathorn – the children’s books authors and amateur naturalists, who were also present at the airport last Monday for the attempted pygmy sloth exportation. The Dallas aquarium refused further explanations as to what kind of working relationship they had with the animal-loving couple . 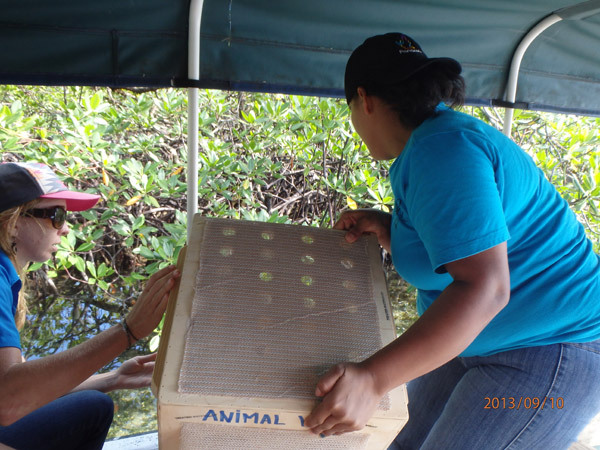 Pygmy sloths being released back on Isla Escudo de Veraguas. Photo credit: the Sea Turtle Conservancy. Back in Bocas, nobody (including the local ANAM officer) had heard about this newly surfaced agreement with Dallas World Aquarium until the incident at the airport last Monday. People were upset that nobody apparently consulted them on a matter as important as the fate of the few remaining pygmy sloths in the wild. Although the IUCN Red List classifies the pygmy sloth as Critically Endangered, the Convention on International Trade in Endangered Species (CITES) has not yet been updated to include the recently described species. Pygmy sloths have been known to science only since 2001 when they were formally described as a separate species, occurring only on Isla Escudo de Veraguas. This is why the Aquarium (or anyone else) needs no import permit from the U.S. federal government. They need only Panamanian export permits, which some experts claim are easily obtained . “The leaders of this effort have exploited the oversight: no one ever anticipated that there would be trafficking of pygmy sloths out of the country,” says Voirin. 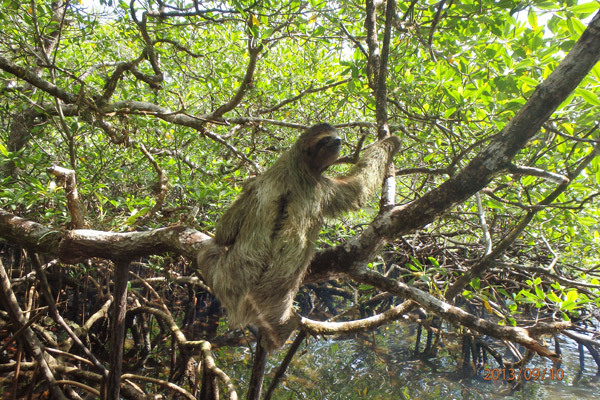 According to him, an effort is underway since last week to have Panama immediately request that the pygmy sloths be listed as a CITES III protected species . All aspects of the incident are still under active investigation in Panama. : The sloths were never in the process of being loaded onto a plane, says Dallas World Aquarium. They didn’t leave the customs area of the airport where they were easily observed by law enforcement. : The only exporter was the Dallas World Aquarium. The remaining individuals on the flight were research assistants and consultant, according to Dallas World Aquarium. : The passengers were unable to comment as they were not involved in the flight planning. 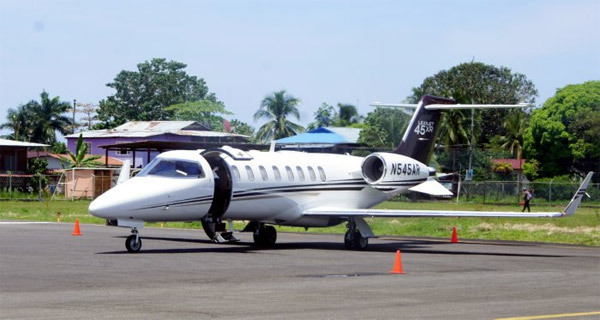 They discovered later that the pilots scheduled a stop on Roatan for fuel only, and no passengers left the airport there. : Once removed from the island, the health and well-being of the pygmy sloths was carefully monitored by the researchers, according to Dallas World Aquarium. : Dallas World Aquarium says it had the prior approval of ANAM and mayor Archibold of Kusapin, under whose jurisdiction the island falls. : Dallas World Aquarium contends that it sent the plan to a number of conservationists and NGOs and received multiple comments on it. However, mongabay.com has not been able to verify who received the proposal ahead of time. All the conservationists mongabay.com reached out to stated they had no knowledge of the immediate plans to export pygmy sloths from their native habitat. : According to the Dallas World Aquarium, there is no basis for further explanation because the DWA has no formal relationship with the Heckathorns. : Formally, the exported sloths would have remained the property of Panama and could be returned at any time if the government requested them. : However, even if the pygmy sloth becomes protected under CITES III, it could still be exported with an appropriate export permit from Panamanian authorities. DWA also provided two documents: a letter from Judy Avey Arroyo of the Sloth Sanctuary in Costa Rica to Kristin L. Vehrs, Executive Director of the Association of Zoos & Aquariums and a field report by Marcelo Espinoza and Rebecca Cliffe. (05/24/2012) The pygmy three-toed sloth (Bradypus pygmaeus) is one of the world’s most endangered mammals, according to a detailed survey of the population, which found less than 100 sloths hanging on in their island home. Only described by researchers in 2001, the pygmy sloth lives on a single uninhabited island off the coast of Panama. But human impacts, such as deforestation of the island’s mangroves, may be pushing the species to extinction. (03/16/2010) Many people consider tropical islands mini-paradises: sanctuaries cut-off from the rest of the world. Some species flourish on islands for the same reason. With few predators and a largely consistent environment, once a species has comfortably adapted to its habitat there’s little to do but thrive. That is until something changes: like humans showing up. Changes in confined island ecosystems often have large and rapid impacts, too fast and too big for marooned species to survive.